This page lets you configure how VPOP3 deals specifically with virus scanning incoming messages. The normal behaviour is that if VPOP3 detects a virus, it will remove the infected attachment (or archive, eg ZIP file) from the message, and deliver the remainder of the message to the intended recipients. You can use the options here to alter this behaviour. Redirect Infected Messages to lets you specify that messages containing infected attachments are redirected to the specified user. 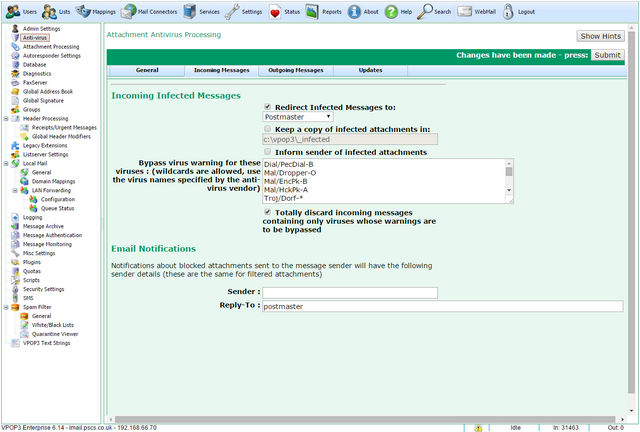 Note that the infected attachment or archive is still removed from the message. Keep a copy of infected attachments in tells VPOP3 to store infected attachments in the specified folder on the server. It is generally not a good idea to enable this option. Inform sender of infected attachments tells VPOP3 to send a message back to the original message sender if an infected attachment is detected. This can cause backscatter so should be used with caution. Bypass virus warning for these viruses tells VPOP3 not to send a message back to the original message sender if the virus name (as defined by the AV vendor) matches one of the entries in this list. The list should be specified with one name per line. * and ? wildcards are allowed. For all viruses, simply use * on a line of its own. Totally discard incoming messages containing only viruses whose warnings are to be bypassed tells VPOP3 that if the incoming message contains only viruses whose names are on the above list, it should discard the message rather than delivering it with the attachments stripped out. This is commonly required nowadays when most email viruses are sent in bulk, rather than legitimate mistakes. If you add a * on a line of its own to the Bypass virus warnings for these viruses option, then all messages containing viruses will be discarded silently. The Email Notifications section tells VPOP3 the sender & reply address to use when sending a notification message back to the original message sender (using the Inform sender of infected attachments option).